Sometimes you photograph a scene which - afterwards - turns out to be very funny. Here is one such scene. The dragonfly in this (cropped) photograph is a male Moorland Hawker (Aeshna juncea), flying over a mountain lake in the North of Italy. Now, as you probably know, the thing about Moorland Hawkers is that they very seldom hang up for a rest; you could spend a whole day admiring their flying skills and unbelievable stamina. 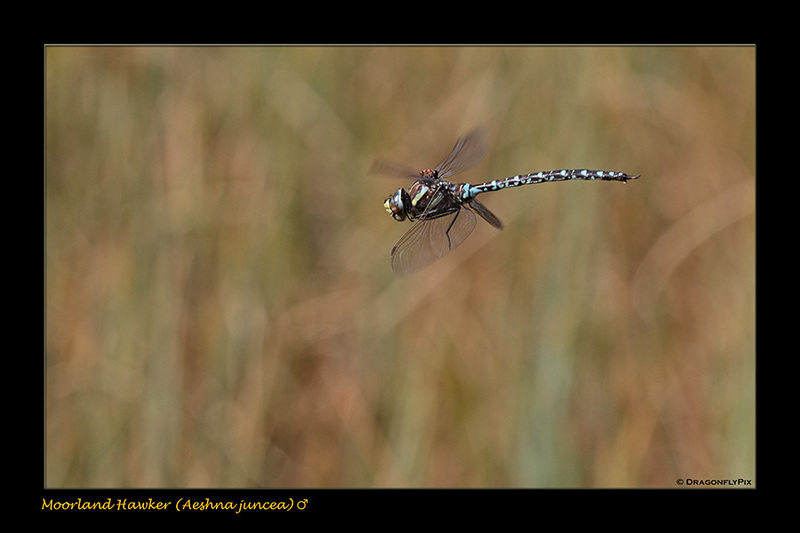 And you could start that day early and finish it late - Aeshna juncea always seem to be the first to arrive at the water and the last to leave. But one thing is certain: the male in the photograph must have taken at least one short break, probably resting on a tree trunk for a few minutes to have a breather and soak up a few sunrays. And it was probably during that break that the ant (possibly a Red Wood Ant, Formica polyctena) climbed on board and stayed there even when the dragonfly resumed his flight. When checking our photographs at the end of that day, we couldn't believe our eyes. Of course we'd like to say that we had seen the whole thing and for that very reason had photographed this particular male, but that simply wouldn't be true; we were as surprised as anyone (including, undoubtedly, the Hawker himself) at the ant passenger.